I move my foot and see that I’ve smashed the head of a small bird that was there, dead, half eaten, in the Moroccan alley. Eyes follow us as we pass, glimmering with the reflections of burning cigarettes that hang from their mouths. It is past midnight and we have just arrived in Fez. Five women, traveling “alone.” We will soon come to realize that here, alone does not simply mean one person, alone means that we are women traveling without a man to accompany us. In the daylight Fez feels different. 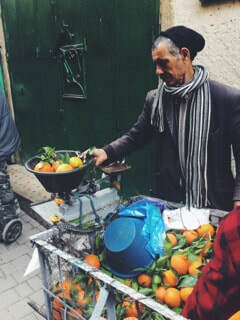 The voices shouting around me in Arabic, French, sometimes English, make the streets feel less crowded somehow. The dull gray has exploded into color; rugs in vibrant reds and yellows, spices in vibrant reds and yellows, hijabs in vibrant reds and yellows, carts with dried pink rosebuds and fat strawberries, and—don’t look—the bleeding red severed goat heads in a pile, twenty dirhams each. Dark hands hold a dried fig toward me, a silent offering. Piles of olives sit on a tarp next to a mother and grandmother, their kids running in circles around them. Cactuses surround palm trees on the side of the street, towering over a rainbow painted wall with black arabic words strung along the top. We stop at a spice shop, the man beckoning us in with his wrinkled brown hand. 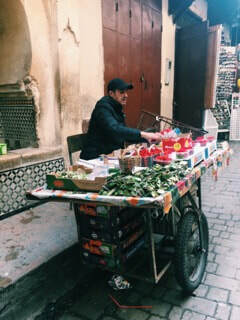 He tells us that his name is Doula, and offers us tea, a sign of Moroccan hospitality. The tea makes a two foot arc through the air, sweet hot water landing on crushed mint leaves. I pick it up, the clear glass foggy from steam, and lift it to my lips. I swallow and my throat sizzles with pain. It’s too hot, but I can’t resist the flavor of the mint and sugar. I take another sip and look out at the small medina road in front of me. I see a girl watching us from the step of a rug shop. The colors and patterns behind her clash with the yellow and black checkered shirt and ripped blue jeans that she is wearing. She stares me down with a mix of curiosity and humor in her eyes. This is her world, and she can see that it is not mine. Here, I am the intruder. 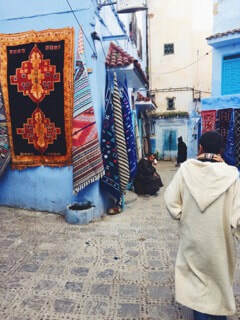 We leave at dawn, bumping along in a taxi with arabic music humming through the radio. I watch the blur of olive trees float past out the back window, the headscarves of the farm workers dotting the fields in a bright mirage of color. Our taxi driver leaves us at the airport, handing us our bags in exchange for the last of our dirhams. “You all happy?” He asks with a crinkled smile. We smile back in response, nodding our confirmation as we turn to walk away.